During our multi-species trips, depending on the type of combination trip you booked, we always tend to get incidental catches of Rockfish. There are several different Rockfish species and their season is open throughout the summer. Lingcod cannot be retained until their season opens on July 1. 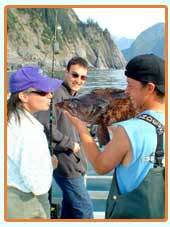 You are allowed to retain one Lingcod and four Rockfish. If you are a Lingcod enthusiast, we recommend that you schedule your trip shortly after Lingcod season opens, so you have a better chance of catching one of these denizens of the deep. As the fishing season progresses further into July and the Silver Salmon begin showing up, we start spending more time targeting Silvers as part of the trip. Rockfish – Less famous than Halibut or Salmon, but still a treat! 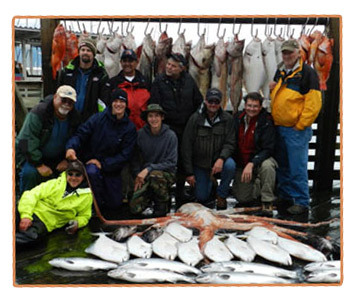 Although there are more than 30 species of Rockfish in the Gulf of Alaska, only a few of these are sport fishing charter targets. They are typically divided into two groups: Pelagic and Non-pelagic. These Rockfish are found in open water close to rocky structures and include Black (commonly called “black bass”), Yellowtail, and Dusky Rockfish. They are often caught incidentally while Salmon fishing near rocky areas. Non-pelagic Rockfish reside in deep water and are a bottom-dwelling fish. Species include Yelloweye (commonly called “red snapper”), Quillback, Silvergray, and Copper Rockfish. These are incidentally caught while Halibut fishing. Rockfish are specifically vulnerable to overharvesting and depletion because of the late age of their sexual maturity (7 to 20 years of age) and their poor ability to survive release because of the presence of a swim bladder. Fish caught closer to the surface may not suffer damage and can better survive release. 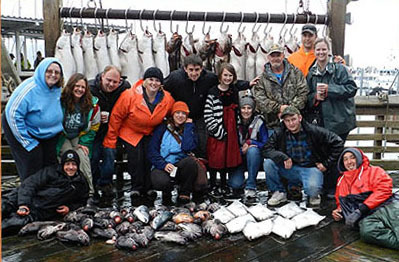 Learn more about Alaska rockfish at the Alaska Department of Fish and Game website. The limit on pelagic Rockfish in four per person per day; the limit on Yelloweye and other non-pelagic Rockfish is one or two per day, depending on the area being fished. We encourage you to fish for and keep only the fish that you plan to eat so as to help us sustain this valuable resource. Sound good? 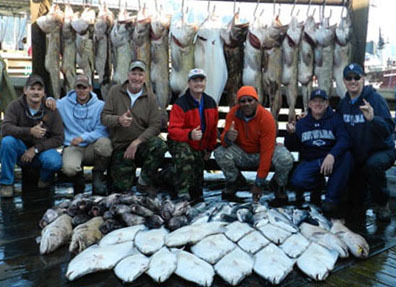 Make your fishing trip reservation now! Lingcod – Can a fish that ugly taste that good??? Lingcod are not really cod, but actually belong to the Greenling family. They are one of the least-attractive, but best-tasting fish on our Alaska fish menu. They have giant heads that are mostly mouth, which is lined with sharp teeth. They can reach up to five feet in length and weigh upwards of 80 pounds. Lingcod are ravenous predators and will devour anything, even attacking Halibut being reeled in. We have netted them with their mouths around Rockfish that we have hooked into that the Lingcod wouldn’t let go of. An aspiring ichthyologist? 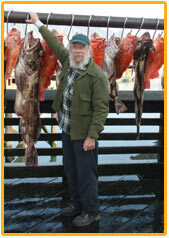 Learn more about Alaska Lingcod at the Alaska Department of Fish and Game website. On our fishing charter, we typically catch Lingcod on scampi jigs (a hook attached to a lead weight and disguised as a squid) in rocky waters. These fish are extremely aggressive, exciting to fight, and delicious to eat – some Alaskans even prefer Lingcod’s tender white meat to that of Halibut. Like Rockfish, Lingcod are also susceptible to overharvesting. The species is protected by a limited season, which starts July 1. Lingcod fishing is also restricted to waters outside Resurrection Bay and only to fish greater than 35 inches in length. 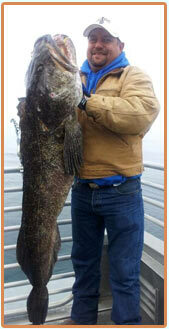 The limit for Lingcod is one per person per day in the Gulf of Alaska. Unless you reserve the full boat for an exclusive trip, we currently do not specifically target Lingcod. Due to stock-depletion evident in the past couple of seasons, we are taking a hiatus from directly harvesting Lingcod as part of our daily trips until we see stocks rebound. However, we still retain Lingcod as incidental catches. For more information on catch limits click Catch Limits For 2019.